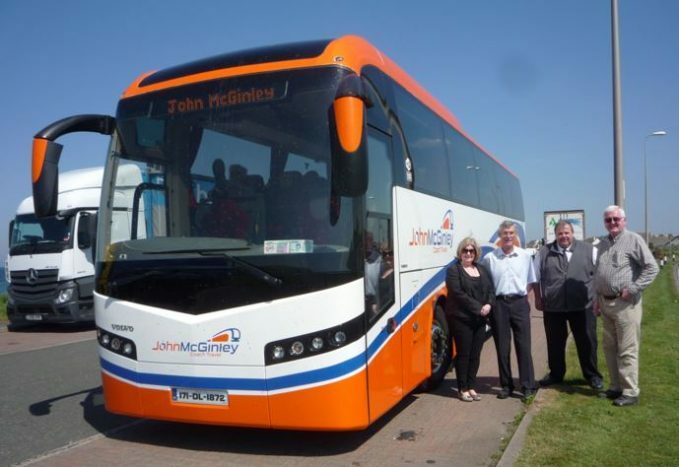 A group of 40 members of the Society have just completed a historic trip to Scotland in conjunction with JMG travel using the Doubletree by Hilton Hotel, Dunblane Hydro for the duration from 20 – 25 May. On Day 1, due to ferry cancellations at Larne the outward journey was re-routed through Belfast. Taking advantage of spare time James McGinley arranged a guided coach tour of Belfast city and an opportunity to those not familiar with this lovely city to experience it, warts and all. It was particularly interesting for the Society members, who were part of its trip to Belfast in September 2009, to see the changes that have taken place there since then. Back then, things were just beginning to settle and now it was possible with comfort to tour the ‘flash points’ that made Worldwide news on a daily basis such as the Divis Flats, Falls Road, Shankhill Road, the Royal Victoria and the Mater hospitals, Crumlin Road jail and Clonard monastery (a must see church)where the Tipperary born Redemptorist priest acted as the go between the men of violence and the British Government. The tour also included a trip around the grounds of Stormont Castle and finally to the Titanic centre for a complementary lunch in the Titanic hotel built around and within the former drawing office of Harland & Wolff, a mere shell when the society members visited the area in 2009. The group then sailed from Belfast to Cairnryan and onwards to Dunblane. On day 2, the day began with a visit to Edinburgh Castle the famous thirteenth century fortress towering above Scotland’s most iconic and visited city. 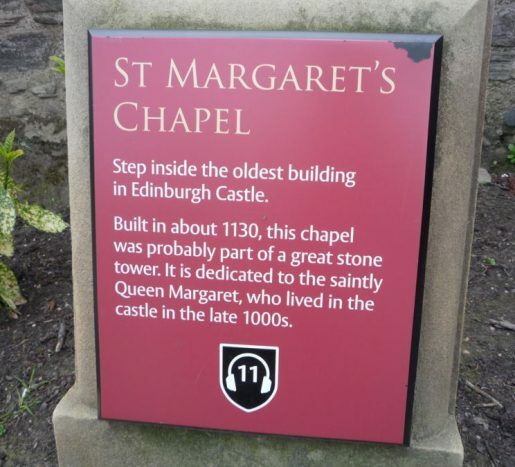 This was an opportunity to view its many features and artefacts including the Portcullis gate, the Argyle tower, the bronze statue of William Wallace (Braveheart), St Margaret’s chapel, the Stone of Destiny and the Crown Jewels. After lunch in the Radisson Hotel there was a visit to St Giles’ Cathedral, the principle place of worship of the Church of Scotland in Edinburgh and the opportunity to view some of its the remarkable features. These included the Thistle Chapel with its stalls for 16 Scottish Knights (who have brought honour to Scotland) and also stalls for the Sovereign (Queen Elizabeth II) and two other members of the Royal family. The day was completed with a walk about tour of the ‘Royal Mile’ conducted by the Blue Badge Guide, complements of JMG Travel who pointed out the many attractions during the walk including the John Knox House museum where the story of his significant role in the Protestant Reformation is outlined. Day 3 began with a visit to the pretty conservation village of Luss on the western shores of Lough Lomond which dates back to medieval times where Christianity was introduced some 1,500 years ago by an Irish missionary, St Kessog. Luss is the ancestral home of the Clan Colquhoun family currently headed by Sir Malcolm who chairs the Luss Estates. They have just opened the Loch Lomond Arms hotel and it was here that the group enjoyed morning coffee followed by a tour of the village and a visit to the ornate church built in 1875 with its spectacular stained-glass windows. 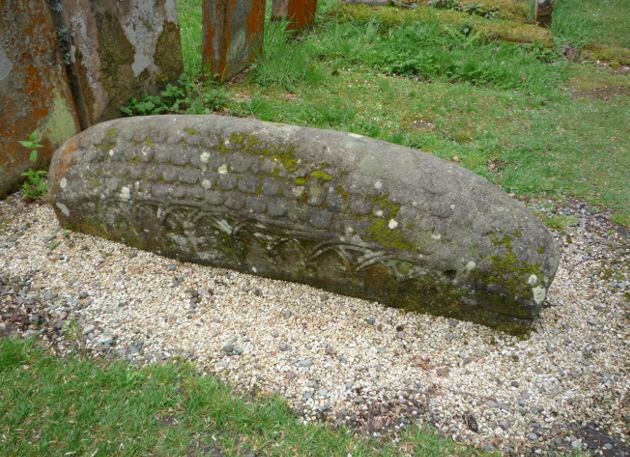 A graveyard adjoins the church dating back to the seventh or eighth century and it has, within it, a unique eleventh century Hogback Stone. Departing from Luss the coach brought the group northwards along the western side of Loch Lomond to the picturesque and planned town of Inveraray on the shores of Loch Fyne, Scotland’s longest sea loch. The town is regarded as the gateway to the Highlands and is the ancestral home of the duke of Argyll. It was built in the eighteenth century on the site of an earlier fishing village under the direction of the third duke and chief of the clan Campbell. It involved the demolition of the original village which now forms part of the parkland enhancing the re-built Inveraray Castle. The beautifully carved cross stone which dates to the 1300s or 1400s located near the harbour with several carvings, including a crucifix and a figure of St Michael, unfortunately, has been defaced, either during the Reformation or later by troops loyal to Oliver Cromwell. The visit to the Castle began with lunch in the old kitchen (which featured in scenes in Downton Abbey) after which there was a guided tour of the Castle itself. Construction of this Castle began in the middle of the eighteenth century based on a sketch by the architect, John Vanbragh, the designer of Blenheim Palace. However, as Vanbragh died before work began, it fell to the architects Morris and Adams, who completed the works in an early modern Baroque Palladian Gothic style. Initially, it was two storeys high, flat roofed, in rectangular shape having three storey-high circular towers at each corner. In 1877 following a fire the eighth Duke hired the architect, Anthony Slevin and as a result a third storey was added and steep conical roofs were added to the circular towers, all with the idea of giving the Castle a Scottish Baronial appearance. The Castle has been the seat of the various dukes of Argyll, who are the chiefs of the Clan Campbell. Earlier dukes held senior military posts and the eighth duke was a Cabinet Minister during the Irish Famine while the ninth duke was married to Queen Victoria’s daughter Louise. The current holder is Torquhil Campbell, who is the thirteenth duke in the Peerage of Scotland and sixth in the Peerage of the United Kingdom. The family live for the greater part of their lives in private apartments within the Castle if not in London. Torquhil is married to Eleanor Cadbury of the well-known chocolate family, while his mother is Iona Mary Colquhoun of Luss and aunt of Sir Malcom mentioned earlier. The family have substantial land holdings and once owned the island of Iona. The tour of the Castle provided a glimpse of both Scottish and the family’s heritage. 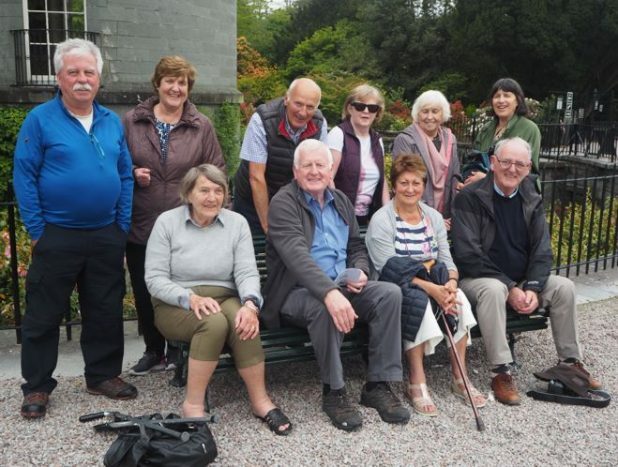 During the tour the group was split into two parties and while one group was enjoying the Castle the other was enjoying the tranquillity of the elaborate gardens. Beginning with the Entrance Hall one is immediately struck with the grandeur of this unique property with so many features, too many to include in this report. In the State Dining Room extravagant decoration continues with elaborate paintings by the French artists Girard and Guinand which hang overlooking the dining table designed by Gillow of Lancaster with light supplemented with a ‘Waterford’ chandelier hanging overhead. The Drawing Room is exquisitely decorated and retains the original set of Beauvais tapestries specifically designed for it, architectural decoration by Girard including the painted shutters and also a circular giltwood palm tree table with a specimen marble top. Immediately adjoining is a turret room, originally designed as a library, but now displaying a superb collection of Oriental and European porcelain and interesting pieces of English porcelain. The Armory Hall which is 21 metres high, is the highest ceiling in Scotland and contains a breath-taking display of arms in elaborate patterns adorning the walls. These include sixteenth and seventeenth century pole-arms and roundels of Brown Bess muskets dating from the eighteenth century with spandrels of muskets alternated with Lochaber axes. The latter and the eighteenth century Scottish Broadswords date from the time of Queen Victoria’s first visit to Inveraray in 1847. In the North West Hall there is an amazing collection of costumes including the Coronation robes of HRH Princess Louise, the robes of the Knight of the Thistle and the stunning cream gown designed by Bruce Oldfield worn by the current Duchess at her wedding in June 2002. After a most enjoyable afternoon at Inveraray Castle the route back to the hotel in Dunblane involved a short sojourn into the Highlands and the opportunity to enjoy some of Scotland’s magnificent landscapes and areas of outstanding beauty. There was a short stop along Loch Awe, which is Scotland’s longest inland Loch, to view Kilchurn castle, built in the fifteenth century by a cadet branch of the Campbell clan but it fell into a ruin by the end of the eighteenth century. 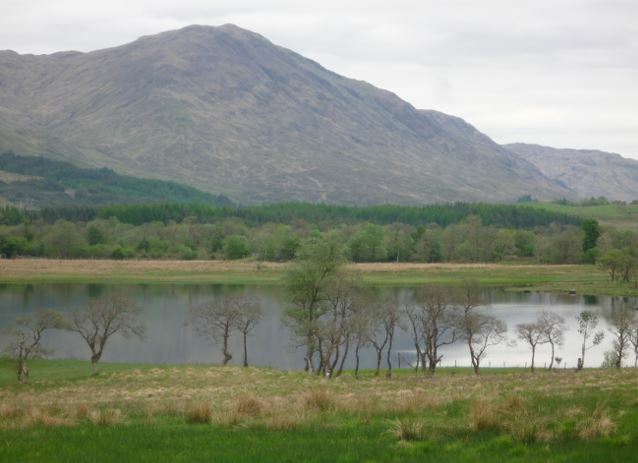 The remainder of the journey took the coach through the Loch Lomond and Trossachs National Park and the area where the Scottish folk hero, Rob Roy (1671-1734) once lived. Day 4 was planned for a local and leisurely study and began with a trip around Dunblane town itself. It is a commuter town with a population of 10,000 and as our hotel suggests was once the location for hydropathic therapy holidays. The town boasts its popular Gold Post Box commemorating the tennis exploits of its local Wimbledon winner Andy Murray. However, Dunblane is also an ancient place, settled and fought over by many including the Celts, Romans and Vikings. It is one of the cradles of Scottish Christianity and takes its name from the Irish St Blane who introduced Christendom to the area – Fort or Dun Blane. The town’s standout gem is its Cathedral which dates back to the early thirteenth century and credited to Clement, a Dominican Bishop who died in 1258. Further improvements were carried out in the fifteenth century including the raising of the tower which is indicated by the colour of the stonework and the late gothic style of the windows. 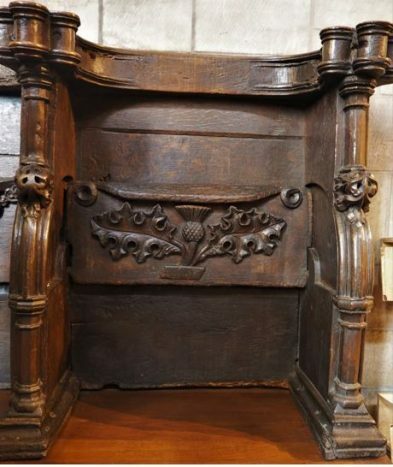 With the Reformation, the Church of Scotland became Protestant and as much of the furnishings and decoration was seen as idolatry these were swept aside. Today, while technically not a Cathedral, as there are no bishops in the Church of Scotland which is a Presbyterian denomination, nevertheless, it is one of the few surviving medieval churches in Scotland and despite its Presbyterian ethos retains many wonderful features such as the carved woodwork, stained glass windows, the ninth century richly carved standing stone cross and the ornate Gothic western front and doorway which has never fallen into ruin. The famous John Ruskin, the love of Rose La Touches of Harristown, County Kildare, commented that: ‘He was no common man who designed the Cathedral of Dunblane’. 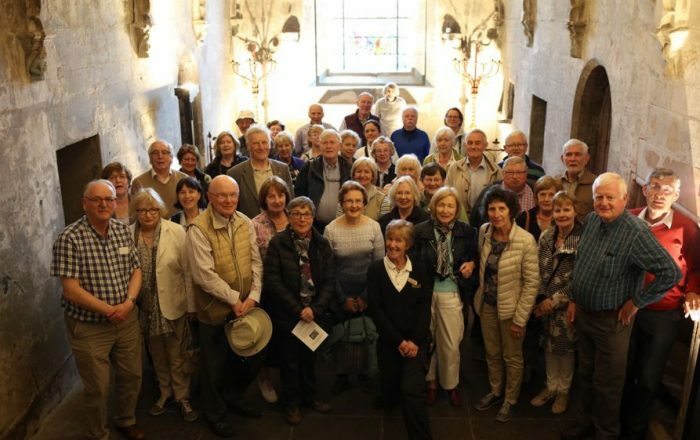 After a coffee break in the famous Cooks hotel in Stirling there followed a guided coach tour of Stirling known as Scotland’s newest city and its environs, during which many of its historic landmarks were pointed out. These included the Castle and Stirling Bridge where William Wallace and his army defeated the English army in 1297. This event rang familiar tones with the group as many had memories of the film Braveheart, large parts of which were shot on the Curragh of Kildare. Nearby is the Wallace Monument consisting of an imposing 220 feet high sandstone tower constructed on a hilltop and overlooking Stirling to commemorate William Wallace (Braveheart) for his heroism. The tower, which has 246 steps, was designed by the architect John Thomas Rochead and built in the Victorian Gothic style. The coach wound its way underneath the gaze of the Wallace Monument to visit the grounds of Stirling University, a campus set within the 360 acre, eighteenth century, Airthrey Castle Estate. It was founded by Royal Charter in 1967 covering a broad range of subjects in academic areas of arts and humanities, sciences, sport and health including an Innovation Park and a Dementia Centre. Also, under the gaze of the Wallace Monument is Cambuskenneth Abbey or the Abbey of St Mary, founded by King David I, around 1140, to serve the royal castle of Stirling. Members took advantage of the stop to view this important site. At its height the Abbey consisted of an extensive complex, firstly under the control of members of the French Arrouaisian Order and later by the Augustinians. It is the final resting place of King James III and his wife Margaret of Denmark who were both buried here in the latter part of the fifteenth century. Bones dug up in 1862 were believed to be their remains and Queen Victoria had them re-interned under a stone monument in what was once the choir of the Abbey. The Abbey was destroyed during the Reformation, afterwards, the stones from it were quarried and used for other purposes, however, the magnificent bell tower survives and its lancet windows and ornamental arcades is a prime example of thirteenth century architecture. After this stop it was off to the Famous Grouse distillery at Glenturrit via the beautiful little town of Bridge of Allen, once an immensely popular historic Victorian spa-town. Here it is claimed that the young Robert Louis Stevenson was inspired while visiting with his family to ‘take the water’ in the mid 1800s. After lunch in the café at Glenturrit members were brought on a guided tour of this authentic working distillery and appraised of the various ingredients used and the processes required to make their famous whiskey. The visit to the distillery ended with the tasting experience. On the return journey to the hotel, the Scottish Blue Badge Guide, which James McGinley sponsored for the entire Scottish trip, sprung a surprise. This was a visit to the unique Roman military fort at Ardoch and the best-preserved example in Scotland. The earliest phase of the fort is thought to date to the Roman’s first century incursion into Scotland and possibly the earliest known frontier of the Roman Empire. 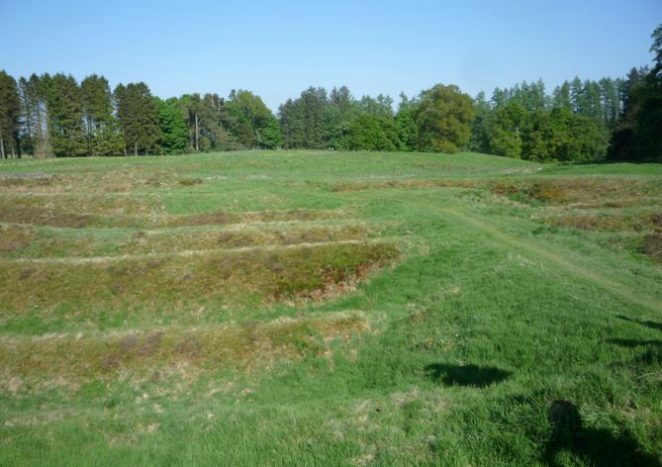 It was subsequently reused around 140-163 representing the two later incursions into this part of Scotland during the Antonine Period and was one of the largest Roman stations in Britain. This monument has major archaeological and historical significance with its many Intrinsic characteristics to help our understanding of the past, in particular to the history of the Roman invasion to this part of Europe. Day 5 began with a trip to the village of Roslin located just south of Edinburgh and after morning coffee at the Original Rosslyn Inn, the group made the short walk to the Rosslyn Chapel. Here is found one of the most remarkable examples of religious architecture in Scotland and far beyond. The Chapel or the Collegiate Church of St. Matthew as it is officially known continues to be a working church, as a part of the Scottish Episcopal Church and member of the Anglican Communion. The Chapel founder, Sir William St. Clair, began work on this glorious project in 1446 and had intended to build a much larger cruciform church with a tower at its centre. By the time of his death in 1484, only part of Sir William’s plan had materialised, in essence its Choir, and it fell to his son, who did not wish to spend any more money, to arrange for this section to be roofed which he turned into a chapel. The St Clair family continued Catholic worship in the chapel even after the Reformation but under duress this practice ceased and the altars were finally destroyed in August 1592 and so the chapel fell into disuse. Interestingly, Oliver Cromwell’s foray into Scotland, while attacking the nearby Rosslyn Castle in 1650, used the chapel as stables, but for some speculative reasons, left it unharmed. Restoration works on the chapel began in 1736 and more followed through the 1800s and continued in the 1900s, some of which had negative side-effects. However, more recent conservation works have, with the benefit of research and technology, resulted in more successful conservation. Soon the Society’s Rosslyn Chapel time slot ran out and the group headed for the Scottish borders and to the Dryburgh Abbey hotel for lunch. 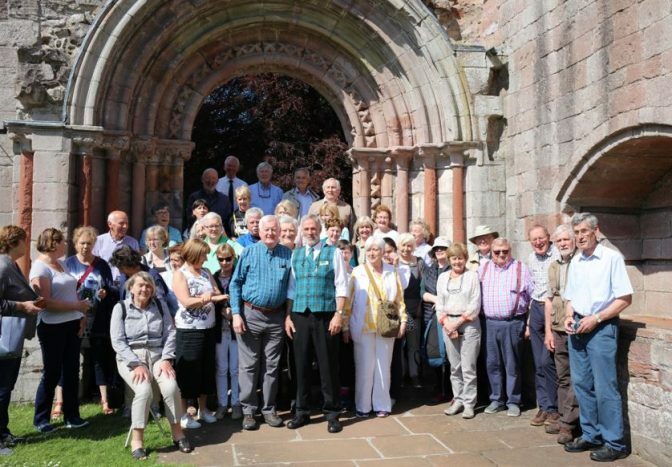 This was immediately followed by a visit to the ruined Dryburgh Abbey where the Society members were warmly greeted by the chief guide, James Butchart, on behalf of Historic Environment Scotland. The Abbey is idyllically situated in secluded woodlands on a loop of the river Tweed and once was the home of a religious community of the Premonstratensian Order. It was first established in 1150 (300 years before Rosslyn Chapel) at the invitation of Hugh de Moreville, Constable of Scotland. James on his walk-about tour referred to the number of savage attacks which the Abbey had been subjected to over the years. These included King Edward II’s soldiers in 1322 setting fire to the building and of course the Protestant Reformation of 1560 which effectively ended monastic life at the Abbey. However, Dryburgh still exudes peace and tranquillity and is a wonderful example of gothic architecture, in particular, the pink sandstone transepts flanking the presbytery. There are many iconic features at this Abbey such as the ‘Processional Door’ which connects the cloister to the south isle of the church. The façade of the doorway facing the cloister has an arched, semi-circular head enriched with dogtooth ornaments in addition to many other features. The best preserved part of the church is the North Transept and this is the setting for the graves of Sir Walter Scott and General Haig. In the Chapter House it is possible to see the plaster and paintwork dating back to when it was first built. To add to the tranquillity of the area there has been tasteful planting of specimen trees, including redwoods, cedars and a yew tree which is possibly dating back to the early days of the Abbey itself. After an absorbing day there was plenty to talk about on the return journey to Dunblane. During the final dinner at the hotel, the President of the Society rose to thank the members for taking part in this historic trip by the Society to Scotland, their cooperation from the time the trip was first muted, their involvement and participation at the various sites all of which made it so successful and furthermore enjoyable. He said this event has been the accumulation of twelve months of difficult endeavours, especially by Bernadette Doyle with tremendous backup from her husband Edward, his own wife May and the Treasurer, Darina McCarthy. Continuing, he thanked James McGinley of JMG Travel for his advice, endeavours in finding a suitable hotel to cater for the requirements of the group, the surprise tour of Belfast, the complementary lunch at the Titanic Centre before embarkation, blue badge guides, a superb coach and as promised his best driver Seán Ferry. Frank Taaffe followed and said he wished to speak on behalf of the participants and to express their thanks and his own for a wonderful and enlightening trip, one which they were privileged to be part of and selfishly they were all looking forward to the next. Day 6 was a matter of packing the bags, saying good bye to the hotel and making a leisurely journey back to Kildare. There were many wonderful sites visited during the stay and many more that had to be left out because of time and logistics. Again many thanks to all who helped in any way and to Anne O’Byrne, Gaye Ashford and Tom Keegan for the photographs to enhance this report.